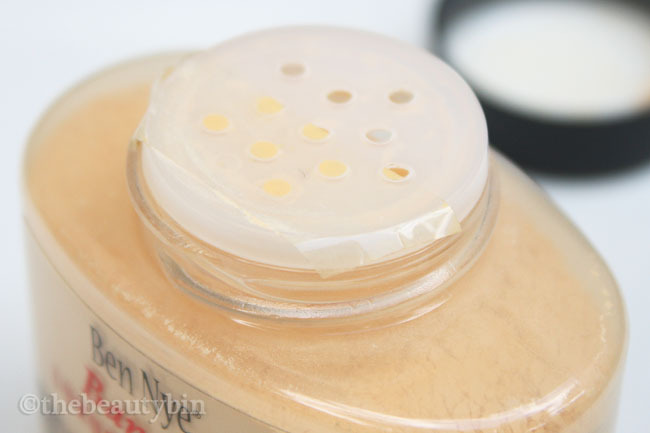 My week-long love affair with the Ben Nye Banana Luxury setting powder ended when I realized I wasn't really getting what I hoped it would give me. I expected the loose powder to give me a healthy-looking skin but I ended up looking aged and unpretty as it mattified my skin way too much. was priced at P450.00 at the time I bough it (latter part of Feb 2013) which is already sulit for 42g of loose powder especially when all you need is a very small amount per application. Because the Ben Nye Banana setting powder proved to be a magical pore eraser as soon as I apply it, I gave it more days for testing even though I frowned at the way it made my skin look flatly matte. Now, the horror begins two hours after application: its oil controlling power nosedives from excellent to poor; my poreless cheeks turn very dry; my skin generally turns from matte to dehydrated. The highly reviewed setting powder did not work well for my combination skin. (Check out reviews from Liz, Donna, and Nikki). The reviews I've read complained about the packaging. I would've too but because I taped up most of the dispensing holes, I din't have powder flying out every time I used it. Everyone hates product wastage. This is an international brand but we have local resellers. I trooped to PureBeauty Serendra (they also have a Trinoma branch) but this is always out of stock. I finally purchased at an online store, Style Quarter (back when multiply was still around). 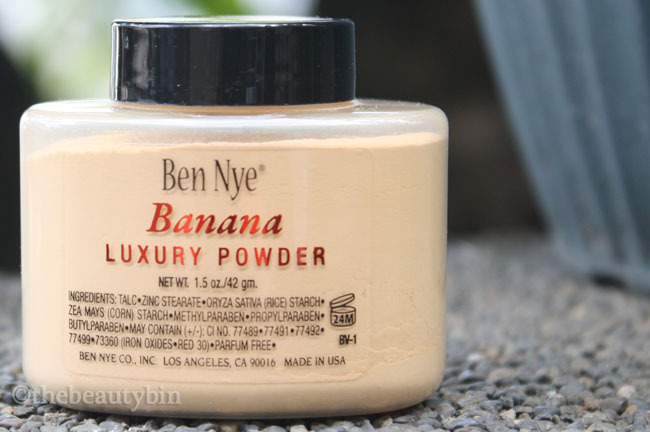 The Ben Nye Banana Luxury powder is a medium to heavy coverage loose powder that gives liquid foundation a longer wear time by setting it matte. Oil control is fair and while it does not give ample coverage for heavily blemished skin, it is a powder that has a low risk for breakouts. If you can buy the 42g tub at P450-500 and you are on the lookout for powders that give off a highly matte finish, then this product may just make it in your HG list. One of the few who did not like it either... It was an over hyped product does not work for everyone. Haven't tried this yet,was planning to buy but since you said it mattified your skin too much I think I'd skip this one. I have oily skin but I don't like super matte face, I prefer if I look luminous ala-koreana (not oily but glossy) haha. Awww. Too bad it didn't work for you. I think this doesn't really work for people with medium and not so yellow skin. This didn't work for pammy too. I'm only too happy that I found something to correct foundations that aren't yellow enough. I also get that overly matte look when I put too much or when I don't use a specific brush. I get the best results when I use an elf studio powder brush or the bodyshop mineral foundation brush. Both are very dense and very fine synthetic-haired brushes. I dip the brush and tap powder the hell out of the brush and stamp my face with it, thinly, just enough to tone down the shine. I tried the brush-off-the-excess technique and it will appear very much as your review says. I meant it won't people who leans toward fair skin or deeper than medium skin. Like you have to be in that sweet spot. Basing on your review, I think I'll like it for my forehead hehe. I really love the matte look but I don't think I'll like the dehydrated skin. Thanks for mentioning that part. In my opinion naman, I don't think overhyped sya because for P450-500, you get a powder that's finely-milled, has a nice texture against the skin, and a lot of product(that first photo nga of the ben nye powder above is already bawas! ), so I think I understand why ladies go gaga over it. Di lang talaga for my skin type siguro na kadiri ang dryness sa cheek area. Yeap, I'd suggest you skip it if you're unable to find a trial size and your only option is to purchase a full size that costs P600+. I get what you mean with the ala-koreana look. I actually call it korluminous, lol! That's what I want, too. As of today, I try not to put makeup on, concealers and powders alike. Gusto ko skincare lang kasi my skin is currently doing okay. These three picked up so much pigment and I didn't like the results. Re: shade matching. You know ladychris sa GT? She's NC15 ata and she loves the Ben Nyew Banana powder! Haha, ang hirap irule out kung kanino babagay itong powder na 'to. Feeling ko nga pang super yellow skin talaga sya. I don't know how my makeup life can survive without this. Pero may mga nakikita na akong ibang powder na yellow din, I might explore kapag mas madali nang mabili. All of the drugstore foundations in this country are not yellow enough (except for a recent find). I matched with bobbi brown stick N4. more yellow pa ng konti, perfect na. Recently I found an EXACT match. L'Oreal Lucent Magique in G4. And madaming reviews saying masyado daw yellow. Sana hindi idiscontinue coz it's a perfect match. Iba kasi yung pagkayellow ko. Yellow with Greenish tint. Parang Yellow/Olive. So when I look for yellow foundation, yellow nga pero leaning towards orange.